Boy, am I a fan of the Coen Brothers. This writer-director team has 14 movies to their credit and in my opinion only a few duds. But peppered in with the duds are some of the greatest movies ever made. I personally rank “The Big Lebowski” as the #1 comedy of all time. I also was thrilled that “No Country for Old Men” won Best Picture in 2007 since it was by-far my favorite of that year. But whether they’re doing comedy or drama, all their movies have one thing in common; they’re full of weird people doing weird things in weird scenes. Somewhere in all that bizarre chaos is a story and usually the story is good. 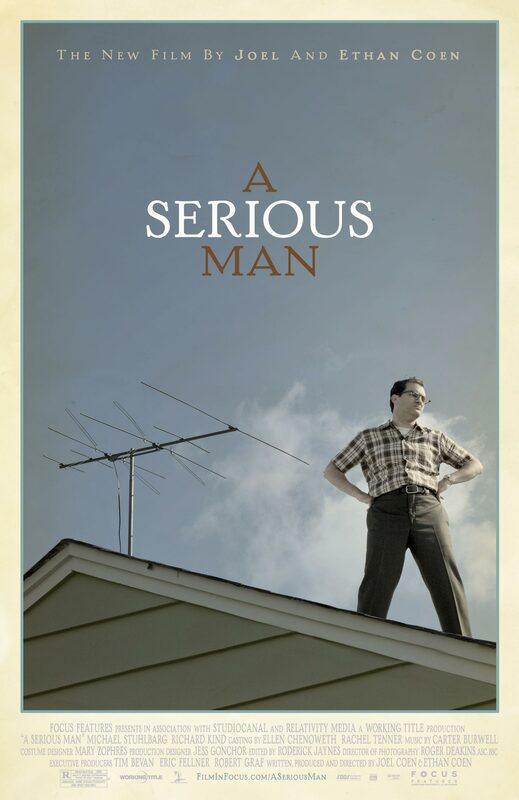 “A Serious Man” is no exception to that even though it’s not one of their best. But what I love about it was the possibility for discussion that it creates. People who hated or didn’t understand “No Country for Old Men” will probably hate this too, even though it’s a comedy. “A Serious Man” is basically a modernization (although it’s set in the 1960s) of The Book of Job from The Bible. It’s loosely based on it much like the Coen’s “Oh Brother! Where Art Thou” was loosely based on Homer’s “The Odyssey.” This one is a little more literal though. If you’re rusty on the Old Testament, Job was a good man that had his faith tested by God and Satan just to see if he was pious because he was successful or because he really had faith in God. If you know how Job ends, the ending of “A Serious Man” shouldn’t come as a shock either. But keep in mind that all this is going on while the weird characters are doing weird things in weird scenes. This isn’t a movie for everyone. It’s not knee-slapping funny but the gradually building crap storm of crazy intrigues you so much that you’re willing to stick it out. And I highly recommend you do since the ending is one of the best parts of the movie. The other great part is the star, Michael Stuhlbarg, who you might know from…well…nothing. He puts on a great performance as a hurting man who’s trying to keep it together and being funny while doing it. You’ll know his name in the future even though you don’t know him at all now. In fact the entire cast you won’t know since they’re all New York City stage actors. It’s quite a departure from the Coen’s usual stable of stars, like last year’s “Burn After Reading.” But again I stress that this movie isn’t for everyone. In fact it tests even the most loyal Coen Brothers fan. Despite having the funniest Bar Mitzfah scene ever shot for a movie, it’s overall not a gut-buster. But, just like Job, you’re tested and in the end your reward is…well…the ending.